When we think of “sad,” we think of tragedies happening, people dying, hope being lost. I want to tell you a story about a different kind of sad, perhaps the most tragic of all, which is found in Matthew 8: 28-34 in the Bible. Bear with me as we explore a story of sadness on our journey of hope. They knew Jesus had power over them and that He was going to order them out of the two men’s bodies, so they begged Him to send them into some pigs nearby. Jesus did so, and the demons caused the pigs to run away, plunging to their death over a steep hillside and into a lake. You would think this is a good thing. You would think that the people would be celebrating the release of two men who are now free of demon-possession. You would think the people would beg Jesus for more of His healing power. But not these people. Instead, they begged Jesus to go away and leave them alone. At first, I want to say, “No, never. I would never do that.” But then, I think of the times when Jesus is probing into my heart, touching the bruised and wounded areas, asking me to yield something to Him. You may have said the same things. You may want to say those very things as Jesus begins to dig a little deeper into your heart to remove the hurtful things in order to help you see the hope He wants to give. Sometimes hope is hard-won. It is realized only after we have come to the end of ourselves, when all our dreams and false hopes have been taken away. And it hurts. Deeply. Yet Jesus knows the way to true HOPE in our lives. It’s in this digging and excavation of our souls that He begins to plant the seeds of true hope. When we are looking for true HOPE in our lives, we must be courageous and brave. We must let the Savior of our souls into the door of your hurting hearts. We must let Him in to do the work of healing and hope, even if it brings pain at first. It seems too hard, too painful. 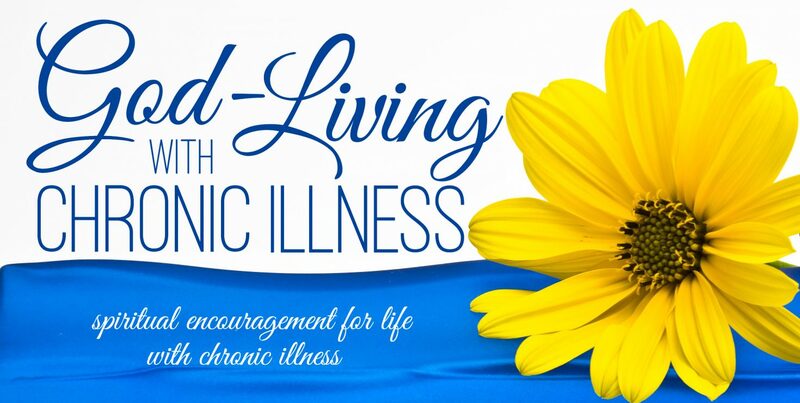 To join some more courageous Jesus-followers on this path of finding real HOPE, meet us at God-Living Girls, an online encouragement group for women with chronic illness and pain, as we start Discovering Hope by Cindee Re. This journey begins tomorrow and will last for 8 weeks as we delve into the place of true hope in our lives. In this group, you will find compassion and help from other women who know what it feels like to lose their hopes and dreams because of chronic illness. You will also see what real HOPE looks like in the lives of women who have been there, done that, bought the tee-shirt. So, please join us on this journey of finding real hope for your life. We will link arms, and we will do this together. This entry was posted in Dealing With Emotions, Faith, Finding Real Hope, Life with Chronic Illness and tagged Chronic illness, chronic pain, Discovering Hope, Faith, Hope. Bookmark the permalink. Oh, God is speaking to me through you today. This is exactly where I am, and, yes, it hurts so bad. I know He has His best for me on the other side but getting there feels like agony. I want what He has for me, and it is an answer to prayer, so I won’t stop Him even though the pain is real. Battered heart and emotions, I want them all gone. I want His healing so much, but it is hard to deny self and let Him probe and remove all the infection and bring lasting healing and peace. I will surrender to His loving hands. I will submit to His mercy and love. I want to know Him better, and this will bring me closer in relationship and will be used to further transform me into His image. Hold onto Him. He sees the cost; He knows the pain. I count it all as lost for He is worthy and worth everything. Thanks for the music. I listened to all the songs this morning and just worshipped Him. Your words are such an encouragement to me. I know it is not easy. I have been in that place a few times, believe me! We will be brave together and move forward in faith. Yes, together. As members of the body of Christ, we can only move forward with each other, in unity, encouraging each other, looking out to the interests of each other, loving each other. As we surrender to the Lord for our care and healing, we will naturally, as an out growth of our love for Jesus, love others, and, hopefully, we will show them the way towards healing, just as you are already doing. We will bear each others’ burdens and move forward together in faith. Be audacious. Live in the joy and peace that rises above our circumstances and can only come from God, so that others will see and desire Him. Let our chains be that which will bring more praise and glory to God. He has allowed them for our good and His glory.